Life is on a roll and everyone knows it. Startale-Yoe's weak (although deep) lineup has forced an ace match almost every single time they don't lose horribly and two players step up to the plate. Life is usually the man for the job, as he has appeared in two of these ace appearances. Although he has a less-than-stellar 5-3 record in Proleague, his two ace wins have made up for his losses and he's tied for first in overall points due to a cool eight point gain last week. Let's be honest here. Did you really expect Dark to do this well in the first round of Proleague? The dark horse of GSL and NSSL revealed himself to be an extremely scary player through Proleague. He's beaten MarineKing, Maru, Flash (who played well), San, and Dear, only losing to Cure and Zest. All of these players are on their team's lineup most of the time (except maybe Dear) for good reason. He's likely to be a very solid player this year. 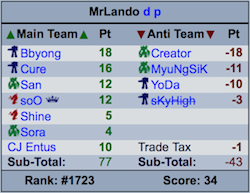 After Creator beat the KT ace twice in PvP, seventeen more people decided to trade him to their anti-team after seeing he was facing Jin Air's ace in a PvP. Two people also took him off their main teams. Guys, this isn't how you FPL. ._. Classic was the fourth man on SKT's lineup last week, a position which is basically turning into an insult as the team keeps winning 3-0. This week, he's not being fielded. SmoKim has diligently been paying attention to the lineups announced each week and trading for budget players constantly. He has successfully gotten two of the top three players (missing only Zest), as well as Classic, while shifting around players as often as actual Proleague teams. 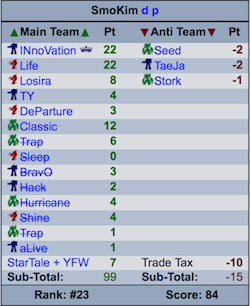 Hurricane, Shine, BrAvO, Losira, Sleep, and DeParture all won while on his team. This is why you trade, guys. This CJ + 2nd string players team has done okay, but all of them lost or didn't play this week, and none of them except Cure have looked great. Meanwhile, his all-Prime anti-team has backfired. All of them have been playing nearly every match and have looked relatively good, so I'm not sure why you would pick all three of them. Heck, he even traded away sKyHigh on his anti-team just to get Creator. That "best team no trades" doesn't follow the rules. Needs at least one protoss. Dammit, you're right. Fixed, YongHwa and Leenock are both $4 and 14 points.